We live in a mobile world. 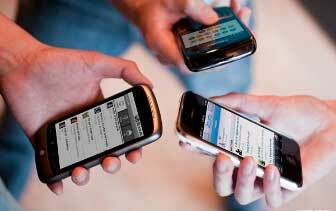 It's been estimated that in 2014, mobile web browsing will, in fact, overtake desktop browsing in popularity. What does this mean for you? It means that if your B2B sales and marketing strategy doesn't include mobile, you'll be left behind. As you develop your lead generation strategy, make sure that you are integrating mobile into your thinking. Doing so will greatly enhance your opportunities. There are a lot of misconceptions about how mobile marketing works. People tend to think that it's some passing fad, or that it doesn't concern them, or that implementing it is too difficult. This leads to a lot of B2B companies foregoing a mobile strategy when they really need one. It's Only a Selling Tool. Sending coupons, deals, and other special offers to your customers' mobile devices can be a great tactic for drumming up sales. But direct selling is just one method of marketing mobilely. Mobile marketing is a method of connecting with your customers wherever they are and integrating your brand into their world. To stay connected with your customers, you can send them appointment reminders, customer satisfaction surveys, and much more. It's Expensive. Mobile tactics are fine for huge corporations with enormous budgets, but what about tiny, private businesses? Well, it's now possible to have mobile marketing, even on a shoestring budget. There are companies that can help implement mobile strategies for any size business and any size budget, that's specifically tailored to meet their needs. It Requires an App. A few years ago, mobile apps were the big thing. Now, they're a dime a dozen. They cost money to develop, and unless you have some groundbreaking new idea, chances are they won't pay off. There are plenty of methods of mobile marketing without using apps. Mobile Doesn’t Apply to Me. If you’re a mid-sized B2B services firm with nothing to sell online, you may think that you can simply ignore mobile. You can’t. Whether it’s the emails that your customers/prospects receive or their desire to find information, you must be prepared to give them what they want, when and where they want it. Now you know what mobile marketing doesn't mean. But what does it mean? How do you use it? One of the keys to mobile marketing is content. Inbound marketing and mobile go hand in hand. Here are a few strategies for putting a mobile spin on your content marketing. Mobile Optimization. The first step is to make sure your content can be viewed and navigated easily on a mobile screen. This means no large-size images, videos, or other files that will take a long time to load on a mobile screen. Make sure everything is scalable, to avoid horizontal scrolling. And use bold headlines, numbered lists, and short paragraphs to make your content easy to peruse at a glance. Finally, make sure you website is designed to be seen on any device. Call-to-Action. A clear, simple call-to-action is essential for an effective inbound marketing and mobile strategy. Something straightforward and highly visible for B2B lead generation: a brief, action-oriented bit of text, along with a button to click. And place it near the top of your content, as many mobile customers are just browsing and might not have time to get all the way to the bottom. Use Progressive Profiling & Smart Forms. As people become increasingly likely to use mobile devices to request information, you must ensure that your forms are designed for the medium. This means be certain to limit the number of fields you require, and don't’ ask for information you already have. Using progressive profiling allows you do develop deeper profiles without frustrating your visitors. Make Sure Your Phone Number is Clickable. When someone is using their mobile device, the likelihood of them taking action is greatly enhanced. Make it easy for them to reach out to you. Inbound marketing and mobile marketing are both essential to the success of your business in this day and age. Combining the two strategies can help you target customers effectively for B2B sales and lead generation, wherever they are.